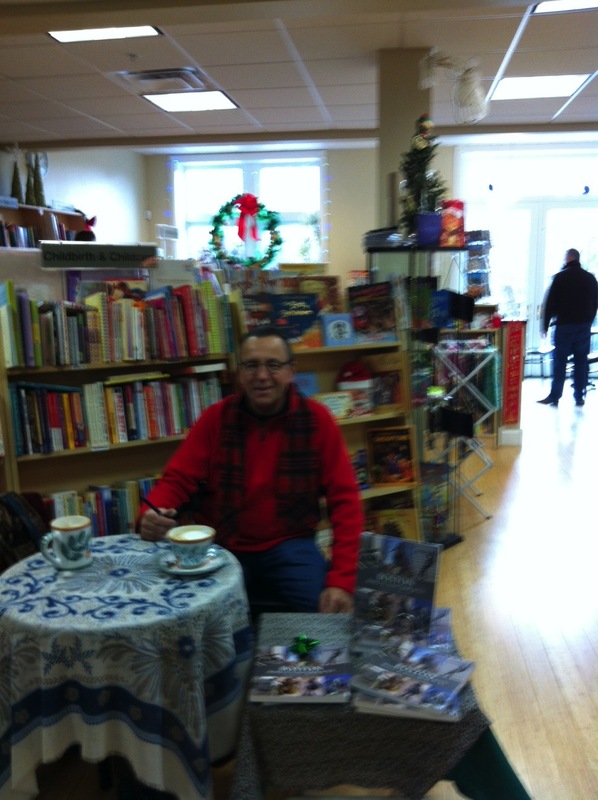 Boston Bronze and Stone second book signing at Medford Squares Bestsellers Book store! Our second booking signing at Bestsellers Bookstore went well. Surrendered by hot latte, great books other authors and guitar soloists and plenty of customers made for a successful book signing! Boston Bronze and Stone goes back to school! Boston Bronze and Stone went back to school recently to stimulate and educate 100 Lexington students about creativity in art and past historical creativity of men and women who were successful in their respective fields of study or vocation. Military, political, medical, educational, technological, musical, academic and religious heroes and heroines from the City of Boston's past 400 year history were represented and discussed. Joe Gallo talks about "Boston Bronze and Stone Speaks To Us"
Joe Gallo will be speaking about his book Sunday 12/9/12 11:45 AM immediately after Old North Church's services and a book signing next door in the Old North Church Gift Shop. The first Made-in-America sculpture is housed in the Old North Church. Boston not Philadelphia, nor New York, nor Washington D.C. can say it has the first American-made Carrara bust of George Washington, Father of our Country. Had the American Revolution not intervened, more London-made memorials might have come to Boston to join the Scheemakers, Cheere, and Tyler works in King’s Chapel. As it was, the next significant memorial was a home-grown product, the bust of George Washington that was given in 1815 to Christ Church, Sa-em Street, by its senior warden, Shubael Bell. During Washington’s progressthrough New Eng-land in 1789 he sat for two hoursin Portsmouth, New Hampshire,on 3November for ChristianGullager (or Gülager), a Dan-ish artist, who came to Americaabout 1781, and lived in Boston,New York and Philadelphia un-til his death in the latter city in1827. The not-very-flattering oil portrait that Gullager pro- duced now belongs to the Mas- sachusetts Historical Society. The Reverend William Bentley of Salem noted in his invaluable diary on 5 April 1790 that, ‘Mr. Gullager of Boston has completed a bust of General Washington in Plaster of Paris, as large as life,’ which was the prototype of the bust in Christ Church. “General Lafayette, standing here in 1824 and looking at the bust of Washington, said, ‘Yes, that is the man I knew and more like him than any other portrait.’’’ One hates to think that the anecdote is true, or that Lafayette was right. Shubael Bell’s gift by no means satisfied the Boston desire to memorialize Wash- ington, for a decade later a local committee sought to erect a full-length statue. For this purpose they had, as will shortly be seen, to turn to the British sculptor, Sir Francis Chantrey, whose work is the first to be illustrated in this series of Boston statues. (Whitehill,14,15). 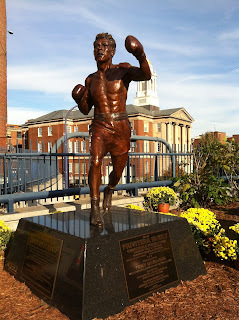 Boston Boxing Legend Tony DeMarco becomes another Boston Monument for the City of Boston and people of Tony's North End. Many people know him as “The Champ” or simply as Tony. Some know him as Nardo because his birth name is Leonardo Liotta. The pride of the North End, Tony DeMarco, “The Flame and Fury of Fleet Street,” the former undisputed Welterweight Champion of the World, will be immortalized in bronze and stone by artist Harry Weber. 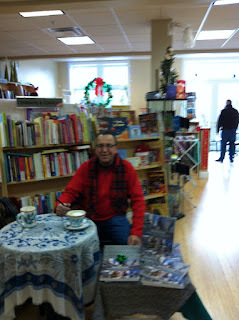 Tony chose to release his book in the North End because: “This is the neighborhood that I grew up in. I have always been greatly supported by friends and family in this neighborhood on August 11, 2011 at the "Fisherman's Feast". "This is where I want my book to be released. These are the people that I love.”Tony said. Nardo, Memoirs of a Boxing Champion is the story of a man who made it to the top of the sports world. Tony defeated Johnny Saxton for the undisputed Welterweight Championship at the famed Boston Garden, just two blocks from his home. His epic battles with Carmen Basilio are considered two of the greatest matches in boxing history. However, he was nearly toppled by tragedy and heartache in his personal life. Tony overcame those obstacles and today is one of the most beloved athletes in the city of Boston.